Only schools serving poor communities are selected for assistance. Some will be state schools which do not have the funds needed to provide more than the most basic facilities, while others will be private schools providing an English medium education. We steer clear of the major tourist centres which are overrun with so-called ‘voluntourists’. All the HELP assignments in India involve teaching in primary and secondary schools. If you would like to volunteer in India, then click on a region that interests you on the right. Click here for opportunities in Nepal. HELP is an organization which gave me a good feeling from the first time I laid eyes on its website. It is a wonderful, idealistic and efficient charity. Not in it for the money, but to actually make a difference. Typically, in the Indian Himalayas, the school year runs from late February to mid-December, and is split into two semesters. The first normally runs from the beginning of March to the end of July, with a two week summer break in the last half of June. The second runs from the beginning of August to the end of the year. However, there are variations to this general pattern. In Uttarakhand, for example, the school year starts in mid April after the final exams in the month of March. Summer holidays run from around mid- May to the second week of July, and winter vacations are held between mid- December to the second week of January. On the other hand, in the Kathmandu and Pokhara valleys in Nepal the school year runs from June to April. In both Nepal and India, during the two main annual Hindu festivals of Dussehra and Diwali the school programme is interrupted by around two weeks of holidays. Dussehra is a moveable feast, taking place some time between the end of September and early October and Diwali, the festival of lights, follows 21 days later. Therefore, at this time of year, preference is given to volunteers who can commit themselves to three months. The weather is usually wonderful in these autumn months, so the holidays provide a great opportunity to trek or travel, or to wander around and observe the many religious activities taking place. Mostly sunny early. Increasing clouds with showers this afternoon. High 24C. Winds light and variable. Chance of rain 40%. Surrounded by Nepal on the west and Bhutan on the east, Tibet on the north, and India’s state of West Bengal on the south, Sikkim’s tiny area of about 2,800 square miles is not easy to see on South Asia maps. Altitudes range from 800 feet above sea level up to the summit of Kanchenjunga (28,169 feet), the third highest mountain in the world. Gangtok is the capital, and it has many of the things you will need to stock up on. You are likely to want to visit it from time if you are working in the more remote schools. The indigenous tribal people of Sikkim are called Lepcha, and Lepcha kings used to rule Sikkim when it was an independent kingdom. However, the Lepchas are now outnumbered by Tibetans and Nepalis, and it was discontent from this immigrant population that resulted in the Indian government incorporating Sikkim as India’s 22nd state in 1975. 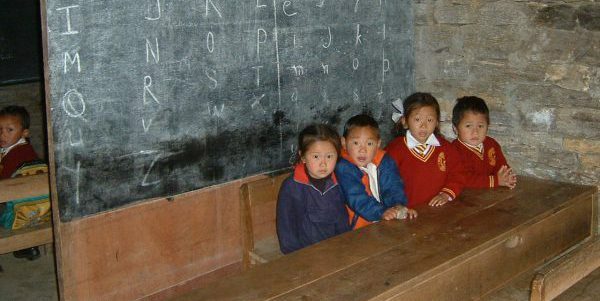 We are currently supporting two remote village primary schools in south and west Sikkim. The formation of the Gorkha Mukti Morcha (GMM) party in 2009 revived a long standing demand for a separate state of Gorkhaland for the Nepali-speaking regions of West Bengal. Although their campaign, which involved strikes and occasional outbreaks of violence, has secured a degree of autonomy, a separate state has not been achieved and many regard the present arrangement as only a temporary measure. The unrest flares up from time to time. For up-to-date information about the security situation, you should consult the travel advisory services of your government. This is the British government’s advice. You may also like to see the US State Department’s travel advice. Kalimpong (4,100 feet) and Darjeeling (7,000 feet) are situated on a sliver of the Indian state of West Bengal that reaches up to the Sikkimese border from the Gangetic plain. This mountainous piece of India is now called the ‘Gorkha hill area’ because it is Nepali speaking, and has some powers of self-government. The famous little Himalayan steam trains run from the plains all the way up to Darjeeling via a series of loops. There are no special visa restrictions in West Bengal so you can stay there as long as your Indian visa allows. If you have been teaching in Sikkim, you can always move to one of the schools in this area to continue your assignment after your first two months. Kalimpong was a British hill station, built on lands that once belonged to the kings of Bhutan. It is spectacularly situated on the saddle of a ‘hill’ and is dominated by a Victorian church that looks as if it has been transported from an English village. However, there is nothing English about the town, which has all the colour and chaos of a small Indian town. Darjeeling was also built as a hill-station by the British in the 19th century, and it became the summer capital of Bengal. Some impressive colonial architecture, and institutions like the zoo, remain intact and in use, and the town remains famous for its tea, which is grown on the flanks of the hills around the town. The town, which is draped over a high ridge, and down its northern side, has expanded greatly since colonial days, and is where the local government of the ‘Gorkha hill area’ is based. The name, Darjeeling, is derived from the Sanskrit word ‘Durjay Ling’, which means ‘Siva of invincible prowess who rules the Himalayas’. We are currently supporting several village primary schools around Kalimpong. Lying in the northern part of India amidst the magnificent Himalayas and dense forests, Uttarakhand (until recently known as Uttaranchal) was formed on 9th Nov 2000 as India’s 27th state. The state borders Himachal Pradesh in the north-west and Uttar Pradesh in the South, and has international borders with western Nepal and China. The city of Dehradun, has been declared as the interim capital of the new state. Dehradun is situated at the Himalayan foothills in the fertile Doon Valley, which is well known for its pleasant climate and natural beauty. The population of the state is around 7 million. The State, which covers 55,845 sq km, is mostly hilly (approx 88 percent) and the remaining 12 percent falls in the plains. It is very rich in natural resources with many glaciers, rivers, forests, and well-known mountain peaks including Nanda Devi, Kedarnath, Trishul, Bandarpunch and Mt Kamet. We are currently supporting a very remote primary school in this region. This assignment is best suited to a couple, or a very self-sufficient individual. Ladakh is the largest region of the Indian state of Jammu and Kashmir. It is situated on the highest plateau in India (much of it being over 3,000 m) which straddles the Himalayan and Karakorum mountain ranges and the upper Indus River valley. The capital is Leh. It was once an independent Buddhist kingdom, and is sometimes called “Little Tibet” on account of its cultural and geographical similarities with Tibet proper. Unlike the rest of Jammu and Kashmir, which is mainly Islamic, Ladakh remains predominantly Buddhist. This is evidenced by the large number of active Buddhist monasteries in the region. Because it is bitterly cold in the winter, the best times for volunteers are between April and early October.